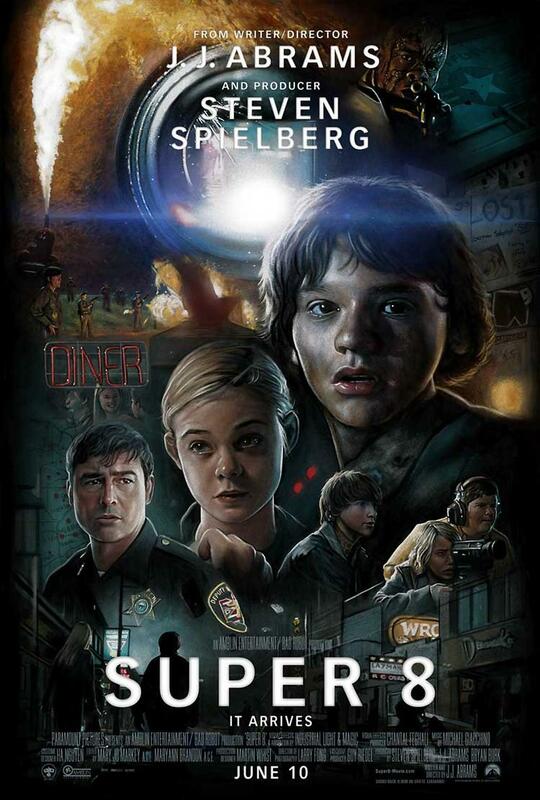 Written and directed by J.J. Abrams, who created such sci-fi tinged cult TV hits as Lost and Fringe along with helming the recent Star Trek reboot, Super 8 has been conceived from start to finish in imitation of vintage Steven Spielberg classics. Right down to that unfortunate title that gets cataloged in the mind somewhere between Superbad, the snuff thriller 8 MM and the motel chain, same way filmgoers confused Spielberg’s Empire of the Sun with Bernardo Bertolucci’s The Last Emperor and The Empire Strikes Back in the ’80s. Abrams has crafted his dream project with an eye toward evoking our memories of cinema past by freely referencing many of the fantasy and sci-fi films Spielberg directed, produced or developed in the late ’70s-early ’80s, the same period in which it’s set. Impressed by this sincerest form of flattery Spielberg executive produced the venture, though a more modest moviemaker might have had reservations about sponsoring such a blind act of adulation. Abrams has deified the man without him even having died yet. Having grown up Hollywood, the son of producers, he knows that unabashed blandishment is one sure way to always get the greenlight. Receiving canonization during your own lifetime may seem a bit premature, but so many decades have passed since Spielberg reigned uncontested as the king of Hollywood, hallowing him through this homage will likely introduce younger audiences to some of cinema’s greatest treasures for the first time, several generations removed though the introduction may be. Spielberg’s name has been listed as prominently in the promotional material as that of the movie’s actual director, making it appear as if he deserved equal credit and from what we see of the finished product, he may in fact have. Considering Spielberg also ‘produced’ such quintessential ’80s entries as The Goonies, Back to the Future and Poltergeist, in which his special touch is more clearly in evidence than that of their official directors, it’s possible he wielded a similar, more than casual influence over the look and feel of Super 8 as well, if only indirectly as its primary source of inspiration. This movie would seem to have Spielberg’s fingerprints all over it, so much so that one might suspect he actually took over the reins at some point. At any rate, as natural progression it follows that Super 8 should have been produced by his Amblin Entertainment, with the company’s flying bike logo from E.T. serving as an ideal opening salvo, heralding Spielberg’s hovering presence and prepping us for what’s to come. Joe’s search for a father figure and his bond with the alien visitor is fully intended to be reminiscent of Elliot in E.T. There’s the shadowy imprint of Spielberg’s Poltergeist on those rambunctious Kaznyk family meals, the retrieval of the little blond girl from the other side at the end, as well as the climax when all the metal in the area is sucked up into the sky, the water tower serving as a giant magnet, like that vortex that spirited away the subdivision. 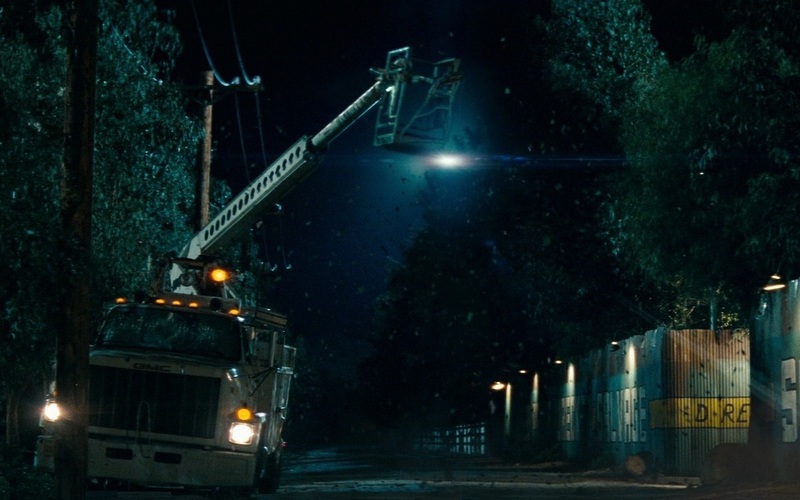 Close Encounters is brought to mind with the government cover-up and evacuation of an entire town under false pretenses while Super 8 ends the same way as both that movie and E.T., with a transfixed crowd gazing up in rapture at the departing spaceship. 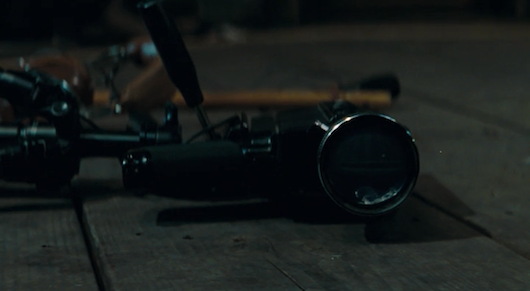 The director teases out our curiosity concerning what the alien looks like, giving us only hints and flashes to build anticipation, as Spielberg did in his creature features Jaws and Jurassic Park. That scene where the power company electrician is menaced on his crane lift by something in the swaying foliage of the tree line opposite seems a direct reworking of the dinosaur attacks in Jurassic Park, as does the later, equally suspenseful bus crash as the kids are cornered in the vehicle with only a thin sheet of Plexiglas standing between them and eternity. Fanboy Abrams has pilfered our pop cinematic past for this pastiche and his ability to shape recurring Spielberg themes and motifs to his own ends is almost uncanny. Sometimes Super 8 may even remind you of bad Spielberg, like 1941, when all the misfiring military ammunition goes haywire and begins discharging, turning the peaceful town into a wonky war zone. Unfortunately, Super 8’s starry eyed director isn’t so discriminating that he bothers sifting the Spielberg wheat worth honoring from the chafe. 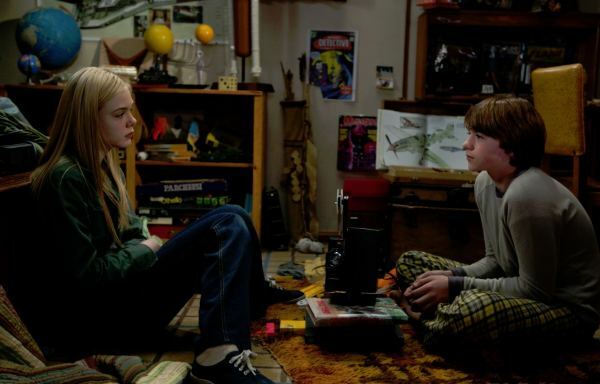 Indiscriminate evidence of Spielberg has been liberally sprinkled throughout Super 8, not just in the alien premise but in general feel and sentiment. In unerring approximation of Spielberg’s signature style, the idealized suburban landscapes, the broken homes, the self-conscious placement of people and objects within frame to form classical, balanced compositions, Larry Fong’s oblique, off-center camera angles in which characters just sort of loom up on you out of the extreme foreground, the puerile yammering of the juvenile protagonists, the mood, the acting, Michael Giacchino’s score (plangent in its poignant moments, then sweeping up over us like a composition by John Williams for the big dramatic highlights), even the lens flares, all seem storyboarded and slightly exaggerated for comic book effect. 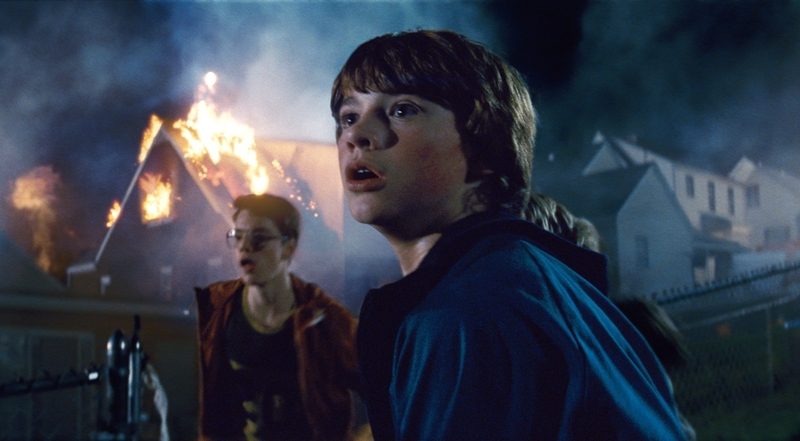 Abrams’ sincere affection for the director suffuses every frame of Super 8, and the movie seems so hazily reminiscent of Spielberg’s early films that this homage couldn’t be any purer. Just as The Artist, released the same year as Super 8, stood as Michel Hazanavicius’ fond salute to the silent screen, director Abrams enthusiastically offers up his own pop art alternative. Simulating the look and feel of the movies that most impacted his childhood, serving to shape his early cinematic consciousness, he’s crafted a spot-on recreation that is in its own irreverent way, the equal of The Artist. Joe describes how he uses a dry brush painting technique to make his model trains appear older than they actually are and Abrams has attempted something along similar lines with the film itself, prematurely aging Super 8 to appear as if it had emerged from a time capsule. Laying his scene expertly in our moviegoing past through changing styles in hair, clothing, slang, he even slips in a passing mention of the potential for meltdown at Three Mile Island. Martin Whist’s production design and Ha Nguyen’s costumes are subdued but just right so that at times Super 8 almost seems like an amiable spoof of the whole Spielberg era, similar to That ’70s Show. As Joe stands beneath a Kodak sign encouraging us to ‘Relive the Memories,’ the corner convenience store clerk tells his overanxious customers that no one can develop film overnight (“I can make it a rush. You’ll get your film back in three days.”), which provokes an easy chuckle from modern audiences, like that gas station attendant later seen rocking to a Walkman before the alien attacks. Quaint as Spielberg’s films might seem to modern eyes, they were set in the present not the recent past like this one, giving Super 8 its own redolent glow of nostalgia. 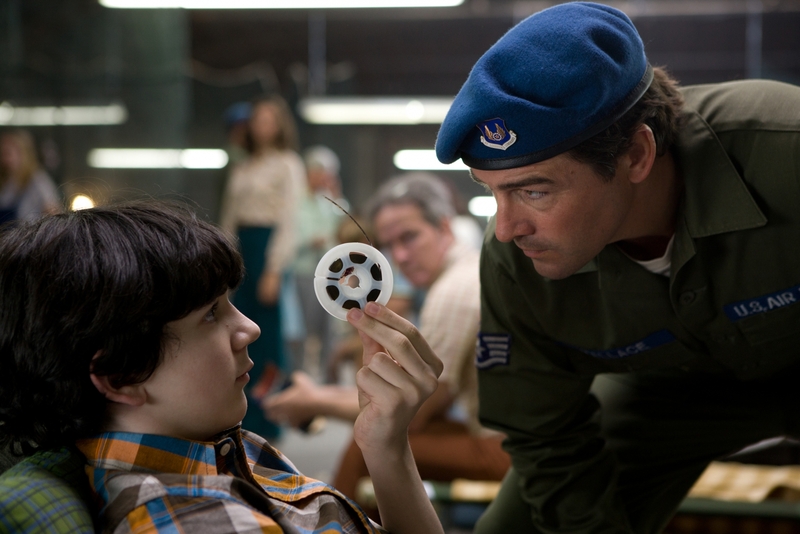 For audience members like Abrams, who were weaned on Spielberg movies, Super 8 can be embraced as a wistful memory piece. 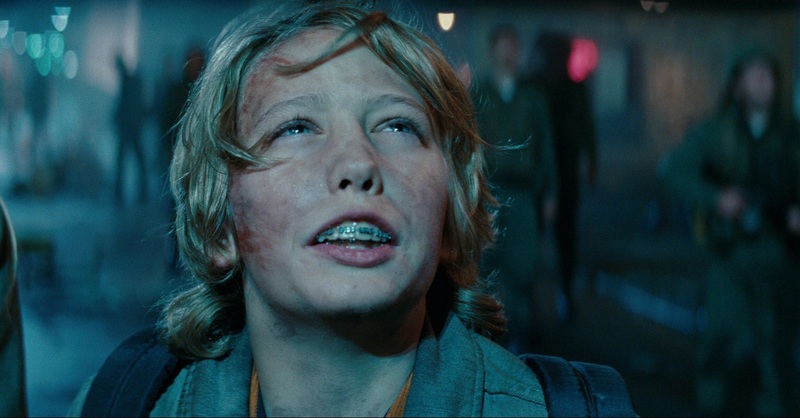 But despite being painstakingly modeled after Spielberg’s classics, Super 8 exists in one of those cinematic cultural voids where no one onscreen seems to have ever heard of the director or his films, though one would think they’d be high on the radar of kids interested in subjects like zombies and monsters. Something is askew. This is an adult’s concept of children’s fantasy and apart from his two little leads, Abrams doesn’t make much effort to distinguish his colorfully quirky assortment of scamps beyond their superficial physical traits (braces, glasses, obesity). When Joe’s father mentions his friend “Cary, who can’t seem to stop lighting things on fire,” for instance, there’s no way for us to know which one of them he’s referring to until much later. Unexpectedly it’s Charles (Riley Griffiths), the domineering loudmouth, rather than Joe, who is the brains behind the amateur movie operation, consistently striving for a better storyline and production value, framing his shots with his hands, acting out all the actors’ parts for them, proving the biggest ham of the bunch. One would think the director of this movie about making movies would have opted to identify with this character. But rather than transcending the ’80s pictures that inspired him, for some reason Abrams slips into the same dated, aerobics-era mentality that equated excess spread with the invasion of personal space. Charles throws his weight around to get what he wants; he’s Chunk from The Goonies come back to us with overbearing pushiness in place of the endearing inferiority complex. Martin (Gabriel Basso), the tall kid cast as Hathaway, the lead in the zombie flick looks to be the eldest, but he’s so emotionally arrested that a day after the crash he’s still crying over the near miss and upchucking at the slightest provocation. His spectacles are the key to the character. Weak in both body and mind (he’s nicknamed ‘Smartin’) the story stresses his high-strung, nervous constitution only so that his mettle can be tested in a crisis, proving him made of stronger stuff. We’re not sure how to take Preston (Zach Mills), the lanky one with the jet black mop since he’s been imparted with no telltale trademark of his own. He’s coiffed with a shag cut that makes it too easy to confuse him with the film’s lead, and because he appears to have been included as addendum when he flakes out on his friends and turns informer we’re entirely apathetic about his actions. Worse, none of the kids’ traits are interrelated to the tasks and roles they’ve been assigned on the movie shoot. As a result, their talents and natural aptitude can’t be shown forming or molding the creative interests they’re pursuing as a career path. Apart from Joe and Cary (Ryan Lee), who finds himself thoroughly in his element, attracted by the charge of the explosives when the kids return to town to find everything amok, the bedlam affording this pyromaniac the opportunity to prove himself the equal of the taller kids who look down on him, none of their skills are brought into play to combat the sort of real life monster they’ve been confabulating on film. 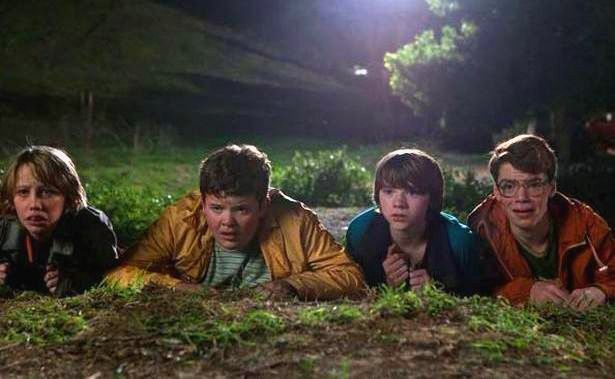 These characters should contribute their individual expertise to the task at hand, the way the kids in The Goonies did, allowing each their own turn in the spotlight. But Abrams’ script has accorded them no signature scenes at the beginning that could later be parlayed into a satisfying pay off. Meaning most of these kids aren’t allowed to grow as characters or to surprise us, which leaves them seeming like story filler, unnecessary background noise. And it’s exasperatingly retrograde that Alice, who is roped into playing Hathaway’s wife in the zombie flick, and Charles’ older sister Jen, the two token females in this boycentric adventure, have been shunted into such traditional roles. Charles’ sister is reduced to vamping the stoner photo developer Donny so that he’ll drive the boys back into the quarantined town, while fair-haired maiden Alice requires rescue from the alien dragon like some damsel in distress. The one good thing about paring this collection of pipsqueaks down to their basic building blocks is that it allows us to assess them at a glance and easily distinguish them later as they get lost amid the commotion during chaotic action free-for-alls. When the kids shoot a scene for their film in front of Woodward’s house while the military ransacks the place, the Air Force maneuvers taking place behind them form a surprisingly fitting backdrop. That’s because these potty mouth prepubescents who cuss incessantly in that precocious ’70s way that places them in the tradition of The Bad News Bears, could be modeled after any stereotyped company of soldiers from an old Hollywood war movie. But where those heterogeneous squads were intended to represent a cross-section of the democratic melting pot, embodying the all-American way of life we were fighting to preserve, the kids here, apart from unfortunate little Alice, are all comfortably middle-class and safely devoid of any semblance of multiculturalism. Although both their parents worked at the steel mill, Joe and Alice seem miles apart economically and the train crash which draws them together is also used metaphorically, to indicate the wide gulf between them. A strategically placed train whistle is audible in the distance for example, when Joe goes to visit this girl from the wrong side of the tracks. Super 8 features the most spectacular locomotive smash-up this side of Demille’s Greatest Show on Earth (the derailment is reported as the largest in Ohio history), upping Abrams’ own production values commensurately since a small fortune must have been expended on the impressive computer graphics, with shrapnel and spare cogs flying every which way, punctuated by fiery explosions and crash and boom sound effects. Caught on the fly as so many important, world-shaking events have been since the mass media explosion, all this is captured by the discarded camera after having fallen over on its tripod. When the train had come roaring past, the kids scrambled to incorporate it into their film, convinced it would impart the production values previously felt to be lacking. Not unlike Jack Black’s slightly crazed Carl Denham, who always tried to turn unanticipated events to his advantage in Peter Jackson’s King Kong remake, Charles gushes “It looks like a disaster film doesn’t it? We can use it, we can film it.” Their instinctual gifts turn out to be as documentarians capturing an incidental record of the clandestine government cover-up as events unfold around them. They’ll set up the camera in front of Woodward’s house as the Air Force provides local color and verisimilitude and later, these little opportunists will recreate the crash to get better coverage by exploding the train model Joe just finished, Cary’s expertise with flammables being brought into play to turn it into a real fireworks show worthy of a 4th of July celebration. 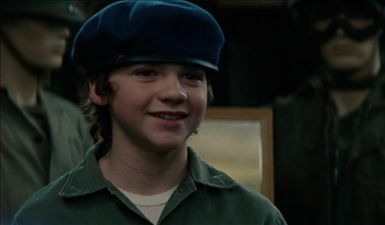 Joel Courtney, the kid cast as Joe the juvenile hero of Super 8, has the chipmunk cheeked openness of a young Patrick Fugit around the time he appeared in Almost Famous, and was apparently cast for his similar air of wide-eyed innocence. Making what was I believe his film debut, the camera has captured his fascination with the whole moviemaking process and translated it over well into his character. He rattles off his lines to pretty girls like Alice with an ecstatic, unblinking breathlessness that is very reminiscent of the young Sean Austin of Goonies. He sounds too tongue-tied by beauty to fully comprehend what he’s saying. His slaphappy thrill that Alice recognizes him when she pulls up in the car supersedes the fact that she’s disparaging his presence (“What’s he doing here?”). Her experience behind the wheel makes her seem like a fascinating older woman, so when she takes the twizzler he offers, as though she had accepted his heart on a platter, his face is plastered with the lopsided expression of someone having just scored. The actor has many similarly sweet moments, such as self-consciously fretting that he should have straightened up his messy room before inviting a girl over, then scrambling to hide his C- paper less it lower her opinion of him, his eyes warning Charles not to curse in mixed company and later basking in the attention when Alice commiserates after he’s coerced into letting his insensitive friends blow up his prized collector’s set for the movie, suffering for his art. Hitting on the idea of showing it off to her before it’s destroyed forever, his excited words trip over one another, “You want to see it? The train, my train model? The train I made?” Actor Courtney was equally memorable in an episode of R.L. Stein’s The Haunting Hour on the Hub, which likewise dealt with the power of old sci-fi creature features and played off his appearance in Super 8. He seems a natural at this stuff. In essence, Joe and Alice are drawn to one another’s ‘art.’ She can appreciate his facility with monster makeups and he’s floored by her acting abilities. Like many filmmakers who have worked in tandem with the women they love, Joe’s feelings for Alice are captured by the camera with the same tenderness he expends transforming her into a glamour girl. Rather than a normal avenue of courtship, their attraction to one another is sparked by his applying her makeup, so it’s easy to understand how Joe’s father might see his son’s involvement with Alice as detrimental to his healthy development. The part is played by Elle Fanning, the less ethereal looking younger sister of Dakota Fanning and she appears as if she could be a perfectly happy, non-neurotic, normal girl off-screen as well as on. Moreover, there’s an unaffected naturalness and ease to Elle’s acting that her more established older sibling never came close to approximating at her age. Not even in Spielberg’s War of the Worlds or his epic Sy Fy miniseries on alien abduction Taken (in which Elle also appeared). Undoubtedly forced like most kids in the biz to grow up too fast, she seems possessed of an inner calm, a reserved watchfulness that suits her role here, the wary child of an alcoholic prone to unpredictable fits of violence. Asked if she can cry on cue for a scene however, it becomes clear that her Alice only projects an impervious veneer, like Joe’s father, to conceal her personal vulnerabilities. Opening up and revealing herself completely during rehearsal, Alice gives a method performance with genuine tears by tapping into her unresolved feelings over the loss of her own mother, “…Don’t go. Don’t leave me. I need to know this isn’t the last time I’m going to see you. I just love you so much.” She bowls everyone over with her unexpectedly soulful, moving reading, which goes far beyond the requirements of the throwaway role. This scene (together with her later zombie impersonation) is a gift to the young actress, an attention grabbing solo meant to prove to us, as much as the naysayers onscreen, what an impressive talent she actually is. Director J.J. Abrams is close friends with Matt Reeves, with whom he co-created the TV show Felicity back in the ’90s, and whose own alien invasion epic Cloverfield he helped produce. 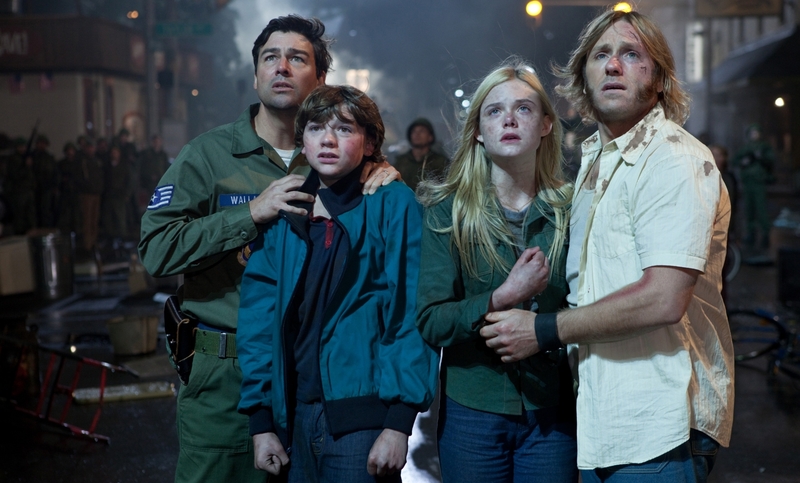 Many commentators have noted the resemblances between Cloverfield and Super 8, with their similar plot points concerning aliens, government cover-ups and found footage, but the Abrams’ movie bears equally close comparison to Let Me In, which Reeves released a few months earlier. Let Me In was also influenced, in a less overt way, by early ’80s Spielberg and the directors screened early cuts of their movies for one another, offering advice and suggestions, so there’s a clear cross-pollination in their work. Though Let Me In played it straight, Super 8 even re-stages a memorable scene in which a horrific murder takes place in the parking lot of a public gas station, to the ignorance of the oblivious clerk inside, along with a suspenseful moment set by a moving train that was at least on par with the derailment here. Let Me In also featured a soundtrack peppered with period ’80s pop impressively arranged by composer Michael Giacchino and like Reeves, Abrams works similar magic with his rowdy young cast of romper roomers, bringing out their quirky chemistry. The use of Elle Fanning may very well have been intended to play up her passing resemblance to Chloë Grace Moretz, who possessed a similar sad, trammeled, bruised beauty as the baby vampire in Reeves’ film. Like her, Alice also encourages the lovelorn little boy here to stand up for himself against an intimidating bully and even appears at his window at night, waiting to be invited in. The unhealthy dynamic between Alice and her forbidding father, who doesn’t want her to have anything to do with boys and chases off her young suitor almost under threat of physical violence (“I’d appreciate it if you’d inform your son that my house is off limits. And so is my daughter.”), appears to have been influenced by Let Me In as well. Exactly what is going on between Ally and her abusive dad Louis Dainard (Ron Eldard) behind closed doors is never fully fleshed out, so we’re left with only our darkest suspicions to entertain. The animosity between their two houses seems more than mutual however as Joe’s father tells him he can’t see Alice anymore either, as if her people were trash not good enough for his son to associate with. Only in Deputy Lamb’s case, it’s because he believes dissolute Louis to be responsible for his wife’s death. The blame is not laid directly at Dainard’s door however, as our good story instincts tell us it should be, so audiences won’t be completely alienated from the character and emotionally on board when both fathers put aside their differences at the end, joining forces in the interest of locating their missing kids. Being raised by neglectful single fathers, Joe and Alice both share the traumatic loss of their mothers in common, a fact which serves to bond them emotionally, making them feel as if they know one another even though they’d never met before the night of the train wreck. When Alice guiltily blurts out that her alcoholic dad worked at the same mill where Joe’s mom was killed, it’s clear that it’s been weighing on her conscience. She feels it was her father’s negligence that led to Joe’s loss and wants to find some way to make it right with him. Opening up to the only other person in the world he feels understands him, Joe explains the significance of the silver locket his dad gave his mother the day he was born. Though he slips and says she still wears it all the time, it’s Joe who now keeps it on him always, to remember her by. Being virtually the only thing recovered from the accident, it has priceless sentimental value to him, so he carries it around as a way of keeping her close, allowing him to continue feeling comforted by her presence. When he hears the alien pounding from inside its train car for instance, he instinctively pulls it out like a cross to ward off danger. Deserted by his inattentive father at the funeral, he angrily snaps the keepsake shut and the reverberating sound is like the clanging of an iron door, symbolizing the wall that’s fallen between them. Once secure in the knowledge that his father can be depended upon to be there for him, Joe can let go of the locket, along with his mother’s memory, allowing it to join the other metal comprising the spaceship that will conduct the equally abandoned alien back to its home planet. 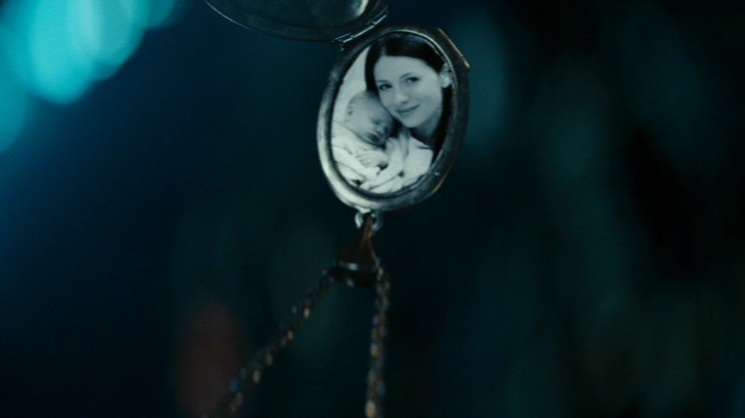 Like so many of Spielberg’s movies, Super 8 focuses on broken homes, only instead of divorced parents it’s the death of Joe’s mother which has shattered the family unit. As friend Charles’ amusingly blessed brood sits down for dinner, Mr. Kaznyk assures the motherless lad, “There’s always a place for you here, Joe. You know that.” It’s an appealing prospect since Joe’s own home life has left him in the care of an emotionally distant, workaholic dad who for all intents and purposes might as well be absent himself. Happening upon his father in the bathroom weeping inconsolably, Joe realizes he’s unable to cope with his own loss much less shepherd his son through the grieving process. Intruding upon him in such an emotionally naked state is as embarrassing as if he’d walked in on him bare, so the door is unceremoniously slammed in his face, preempting any hope of opening up a clear line of communication. 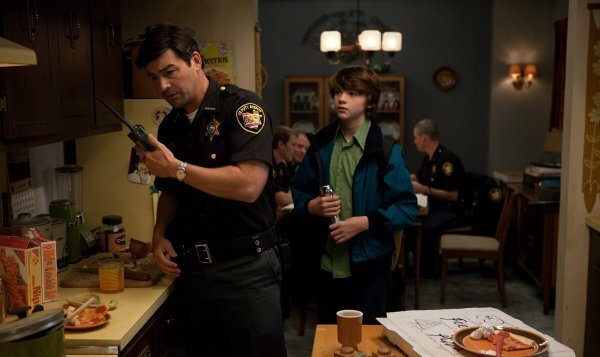 The heart of Super 8 is focused on this estranged relationship, beginning in the emotional deep freeze of winter, with the weather seeming to embody the big chill between father and son. Joe sits apart, as the guests at his mother’s funeral worry how the two men will adjust without a woman in their lives to play mediator. Unable to cook a homemade meal, Joe’s father takes him to a Sports Bar for dinner, allowing the camera to accentuate the space between them as they awkwardly occupy the same booth. Jack calls his son by his full name, Joseph rather than the more familial Joe everyone else uses and as deputy chief, must leave his wife’s wake in order to haul the drunken Dainard downtown. Choosing duty over familial devotion as he always does, he abandons his emotionally distraught son when he needs him the most, perpetuating their dysfunctional pattern. More than Spielberg maybe, Joe’s hobbies and his strained relationship with his stern father may remind viewers of Tobe Hooper’s Salem’s Lot. The kid played by Lance Kerwin in that effectively creepy 1979 made-for-TV movie also clashed with his disapproving dad over his preoccupation with monster makeups and toy models. Hoping it was a phase he would grow out of, it actually conditioned him for the threat from the undead that would soon be overrunning his town. Along with the other impressionable kids in his circle, who have retained the power of imagination their pragmatic parents lack, Joe’s thorough indoctrination into the world of the supernatural likewise prepares him to face the emerging crisis he’s confronted with. He proves more adept than any of the fully grown adults, who are too rational to accept the evidence staring them in the face. He’s the only person to believe Dainard’s fantastical claims concerning his daughter’s abduction for instance, earning him the hard-won respect of Alice’s hostile father. And it is Joe’s expertise at crafting train sets which makes it possible for him to identify the wreck by its Air Force colors and insignia. When Pruitt himself goes missing, his absence forces Deputy Lamb into the fallen sheriff’s office. Struggling with the same doubts and insecurities he faces as a father (“He’s only a deputy, he’s not the sheriff,” the convenience store owners skeptically whisper as he investigates what they believe to have been a bear attack! ), Jack must prove himself on two fronts simultaneously. He must prove himself in his new office, reassuring the citizenry he’s been elected to protect and serve (“We like you Jack but we need Sheriff Pruitt back.”), as well as prove himself a fit father for the son he’s now solely responsible for. His Freudian slip during his argument with Joe reveals how closely the two concepts are connected in his mind. Opting to abandon his boy again, the reasoning he uses actually serves as a stronger argument for precisely why he should stay, “You listen to me, I’ve got 12,000 people in this town who are scared out of their mind. They’ve got one person to rely on. It used to be someone else, but now it’s just me.” There’s no one else for Joe to rely on either now that his mother is gone, but his father has unwittingly revealed that as far as he’s concerned his responsibility lies with the voting public who elected him to office, that they’re more important to him than his own flesh and blood, a devastating statement. Jack can feel secure committing himself to the welfare of strangers because it doesn’t call for the same degree of emotional investiture. Authority at the local level has been usurped by the military, which is swarming in as if the area were under attack, taking Geiger measures and jamming the frequencies of ham radio operators so no messages can get in or out. This leaves Deputy Lamb seeming as ineffectual as Roy Scheider’s powerless police chief in Jaws, who was similarly undermined by corrupt local officials and the summer tourist industry. When Lamb finds the kids filming in front of Woodward’s house, with his own son in the apparel of the enemy Air Force, he handcuffs him in the back seat of the squad car as if hauling in a desperate criminal. Though Joe silently assures Alice from across the way she’s not the cause of the trouble, it’s the way his father blows up over his friendship with her, laying down the law, which instigates his son to defy him for the first time in order to defend her honor in his immature fashion (“You don’t know anything about Alice either. She’s kind… She’s nice to me!”). Having acquired a tarnished reputation thanks to her father being the town drunk and her trashy family a disgrace, Alice angrily endeavors to live up to the public perception of her as a bad seed who steals cars and engages in underage driving when chauffeuring her friends to their night shoot. Little wonder Joe, the son of a cop who has been brought up under penalty of law to always follow the rules (“He’s the Deputy’s kid!” Alice objects when she sees he intends to hitch a ride in her stolen wagon), whose father is committed to upholding law and order, this quintessential good boy whose last name is the innocent Lamb, should be so attracted to a reckless rule breaker. As his father feared, her ‘bad’ influence starts to rub off on him as Alice entices Joe to start breaking rules as well, even his father’s cardinal one about not associating with her. Heading down the road toward delinquency, he lets her climb in through his window, disregards the Air Force’s quarantine, breaks into his school after hours. Joe is relegated to performing all the menial, nondescript, multipurpose tasks on the film shoot, wearing several creative hats – makeup, sound, special effects, everything but sweeping up the floors after everyone else leaves. He’s a grunt, a glorified super who hasn’t even been cast as the romantic lead in his own movie. With Alice’s encouragement, he stops letting bully Charles have his own way about everything, as he did when he blew up Joe’s model train. 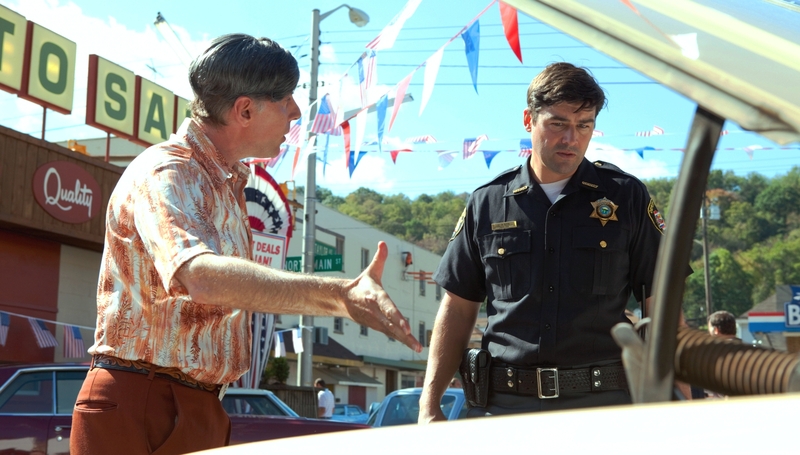 Having come into his own, standing up for himself, Joe starts demonstrating a newfound assertiveness by taking the lead, prompting the already drugged and disoriented Donny to do a double take wondering “Since when did this one become so bossy?” Just as his father takes over the missing sheriff’s duties, Joe likewise takes the driver’s seat, quite literally at the end there after the kid’s designated driver becomes incapacitated, making the image complete. Modeling himself after his creative son for once, rather than vice versa, Joe’s by-the-book policeman father must begin breaking the law himself. Costumed in the same Air Force paraphernalia Joe had been seen wearing earlier, this father who once disapproved of his son’s artistic pursuits must now become an actor for all intents and purposes, essaying his assigned part in order to slip out of the military holding tank under the nose of the authorities. He even blows up a flammable army truck to create a distraction, though he’d earlier disparaged Cary’s pyromaniac inclinations. The boys learn that Woodward was dismissed from Nellis Air Force base for “subversive conduct, whatever that is” and though they may not understand the term, by defying the authority of the U.S. armed forces they’re actively engaging in the same sort of unbecoming conduct themselves. 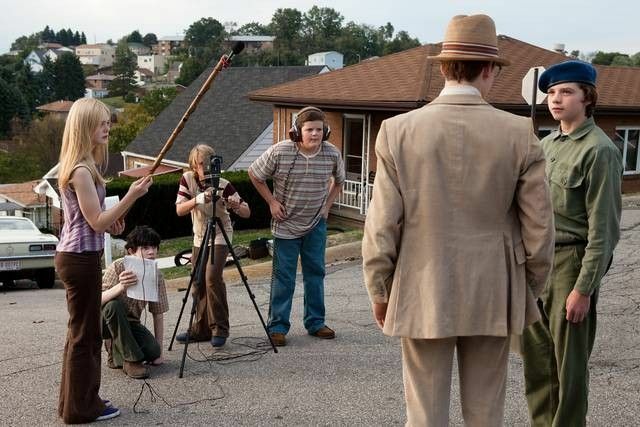 With its retro, alien paranoia plotline (the FBI agent in the film within the film the kids are making is costumed like one of Hoover’s G-men), Super 8 is a blast from the past in more ways than one. 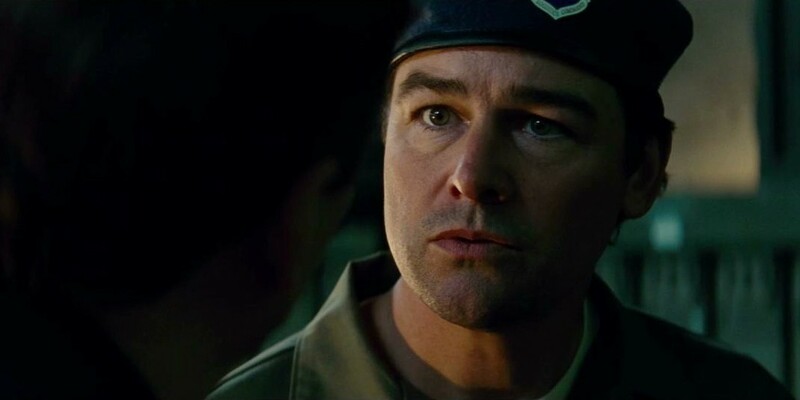 Abrams’ script draws an amusing analogy between the anti-commie fears of the McCarthy era, as embodied onscreen by such sci-fi parables as The Thing and Invasion of the Body Snatchers, and the similar paranoia engendered by Reagan’s nuclear arms race with the Soviet Union in the ’80s. The decades melt away as irate citizens at the town hall meeting declare their belief that all the strange events transpiring around the community are the direct result of a Russian invasion rather than one from outer space. Panic sets in as the electric grid goes down plunging the area into darkness. With a lack of working generators, radiators being ripped from cars, telephone wires falling, phone lines dead, microwaves stolen, guns misfiring, surface to air radar on the fritz, convenience store cameras erased by magnetic interference, and pets like Joe’s dog Lucy disappearing, commies still rank as the most likely suspects. “Unless you can tell us who’s been messing with our stuff, I say it’s the Soviets!” one resident asserts with conviction. Looking for Lucy under darkening skies, peddling past the type of electric tower the alien targets, when Joe tacks a reward poster to the community bulletin board, the camera tracks back to reveal the alarming number of other lost dogs that have recently gone missing. They all appear to be fleeing to surrounding counties, as if deserting a centralized disaster area and the map charting their radius away from ground zero makes it appear as though the Russians had already dropped the bomb. We initially assume that this escaped alien may actually be a genetically engineered bio-specimen (like the dinosaurs in Jurassic Park), a creature created by the government rather than the result of a crashed landing. But as Woodward (named after the investigative reporter who blew the lid off Watergate) reveals, ever since the alien was stranded here on earth and taken prisoner by the military, it has been desperate to reconstitute its spaceship and return home. This creature makes a psychic connection through touch, allowing it to experience the emotions of the humans it comes in contact with (“the moment we made contact, I understood him and he me,” Woodward relates). The script’s linking of the alien in this way to a black man, America’s most prevalent ‘alien’ other in the past, is likely no coincidence, any more than it was in the cult 1984 film Brother from Another Planet. It’s why Woodward maps the trajectory of the military’s cross country transport so as to know precisely where to intercept it, determined to do everything in his power to free the alien from its bonds. Having felt its pain, he wants to help the critter escape those captors who feel they own it, body and soul (“It is mine. He is mine!” Nelec, the Air Force colonel in charge of the cleanup raves). Assuring Deputy Lamb that the government had no dangerous property aboard the crashed transport, Nelec is in place to perpetuate the military’s long standing record of obfuscation and denials concerning the existence of extraterrestrials. 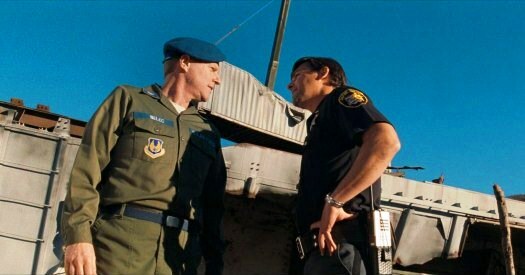 The train wreck is Super 8’s fanciful reworking of the Roswell crash so when the deputy shakes hands with Nelec he might as well be sealing a deal with the devil himself. This man appointed to speak on behalf of our national infrastructure is completely without conscience, a blandly complicit sociopath. He cordons off the area around which the creature made good its escape by encircling it with flamethrowers, the resultant wildfire raging out of control and threatening to reach the Lillian Chemical Plant, triggering another Three Mile Island. This affords the military a perfect cover. Having everyone in the vicinity evacuated gives them the freedom to trace their quarry without attracting suspicion. Colonel Nelec has no qualms about promptly betraying the deputy’s trust by placing him under military arrest when he begins asking too many pointed questions or swearing on his mother’s life to give Woodward something for his pain as soon as he reveals who witnessed the derailment, all the while surreptitiously loading a syringe that will put him out of his misery permanently. When Woodward is assassinated, it’s at the hands of Nelec’s black underling, Overmyer (Richard T. Jones), in order to divest the action of any unpleasant racial overtones, but it still seems like black on black crime instigated by the institutionalized racial policies of white oppressors. On the bus transport, Nelec sends the more expendable Overmyer out to tranquilize the monster rather than putting himself in harm’s way, and makes no attempt to rescue another pinioned soldier before the alien gets him too. Stunningly, every airman under Nelec’s command ends up dead, retribution for adhering to the slave mentality by foolishly following the cowardly officer’s commands, I suspect. There are revelations that aren’t properly prepared for, such as the one about the director being in love with his leading lady and things that don’t make sense. For instance Charles, who seems more concerned than anyone else about publicly discussing the crash, even asking Joe if he wants to take a chance on something happening to his last surviving relative by talking, inexplicably exposes himself by openly filming in front of Woodward’s house for all and sundry to see. Which makes one suspect the authorities should put two and two together and realize these are the same culprits implicated at the crime scene. Abrams’ script makes no attempt to develop certain possibilities. When Joe gets the big break all understudies dream of for instance, filling in for an absent star, there’s no attempt to suggest that he’s been bitten by the acting bug or even that the realization has begun to dawn that he’s a far more vital member of the film crew than he’s been given credit for previously. And this entire incident would have meant far more if he had been required to play a big romantic scene with Alice rather than engaging in a trivial bit of business with another actor. Unsure how to wrap things up, the director has simply tacked on the ending from E.T., though surely the same warm and fuzzy feelings aren’t supposed to be applied to the alien here. Instead of a wizened gnome falling out the sky to make a lonely little boy happy, Super 8’s spaceman has been turned into a landlocked version of Bruce the shark in Jaws coupled with the thunder lizards from Jurassic Park. 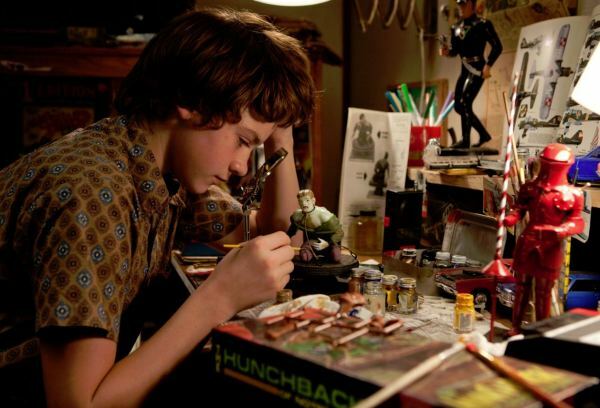 While the shark has grown legs in order to invade Spielberg’s suburbia, it too shares a link with the movie’s young protagonist similar to that between Elliot and E.T. In his online article, Unearthing Grief and Love in Super 8, Stephen Russell-Gebbett draws a convincing correlation between Joe and the alien, which emerges from the same sort of freight car Joe himself might have modeled, pounding its way up out of the depths of his own subconscious. In this light, the agency of the invasion operates on a metaphorical level, embodying all the rancorous, inner turmoil the death of Joe’s mother has stirred in him, leaving his familiar world in ruins. Much like the kid in Where the Wild Things Are, the monster under Joe’s bed is a reflection of his own chaotic emotional state, the frightful fears and anger over his loss having been unleashed and concentrated into manifesting a tulpa. Just given teasing glimpses of the alien (in a spilled pool of gasoline, trailing across the horizon after wreaking havoc), these effectively eerie flashes stoke our anticipation to see the full reveal. Yet when we do finally get a good look at it, this alien proves to be an extreme disappointment. At a distance it had been made to look like an enormous arachnid akin to Tarantula or one of Ridley Scott’s lethal Aliens, but in close up it appears to have been designed by stitching together an oddly compiled collection of spare insectoid parts, accompanied by the sound recorded trilling of a giant praying mantis or some cicada. This is the sort of generic creature you might find in any old sci-fi feature so it lacks distinction. Super 8 warranted a far more memorable monster, to match its other fine qualities. Though this alien doesn’t look like anything we ever saw in Spielberg (it does, as commentators have pointed out, suspiciously resemble Cloverfield’s alien), when it opens its eyes I assume we’re supposed to recognize Woodward’s cognitive thought. The metal armature the alien is constructing has turned its underground lair into an infernal steel mill itself with sparks and fires and smelting ironworks, and the visual similarity connects the dots between its sudden presence and the death of Joe’s mother which would appear to have called it forth. Joe only survives because the alien makes a psychic connection with him, receiving an impression of his own similar, grief-stricken state, same way Joe sees something of himself in this visitor from another world. While his attempt to communicate with the creature seems as ill-advised as that crazed scientist at the end of The Thing, he manages to bond with the beast, commiserating with fellow-feeling “I know bad things happen. Bad things happen but you can still live!” He may as well be talking to himself. Joe tames the beast and by doing so also those wild, alien feelings that have been welling up in him since his mother’s death. But then if this carnivorous critter can sense the feelings of the victims it comes in contact with, you’d think it would have evolved beyond consuming them long ago, much less leaving cocooned bodies swinging upside down from the ceiling like meat in a butcher shop. The movie still wants us to feel sorry for this creature, the same way we were manipulated into pitying King Kong even after he’d trampled half of New York underfoot, and it’s a very hard sale. This beast of prey alienates the audience by callously devouring innocent people, so we never develop the same sympathy for it that Joe and Woodward do. Seeing this alien go unpunished is tantamount to watching Jaws swim off into the sunset scot-free and in this context, Abrams’ reworking of E.T.’s ending seems in very poor taste; it just doesn’t sit right at all. 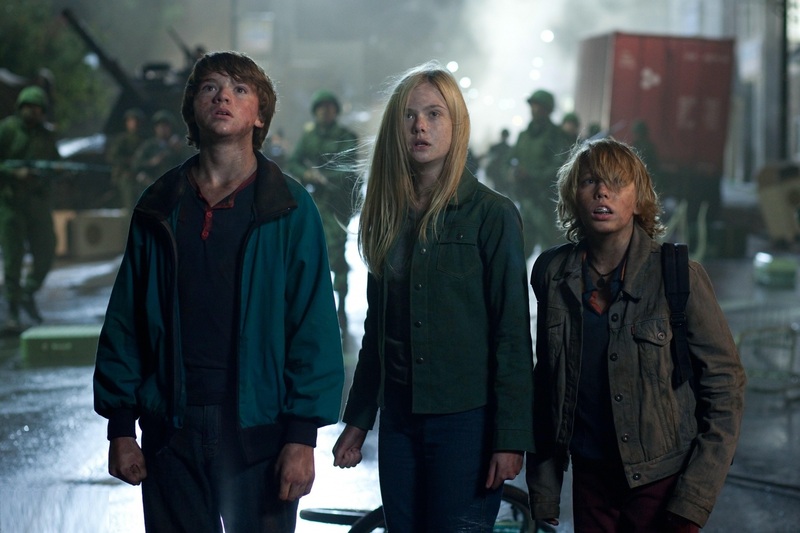 Though Super 8 has gotten all the incidentals down pat, the movie possesses a tone more in keeping with the dark, dystopic Spielberg of War of the Worlds than the sweet-tempered Spielberg of Close Encounters of the Third Kind. The director’s heart has hardened with the years, and Super 8’s approximation of Spielberg kitsch seems to get its decades confused. Even the direct visual allusion to Close Encounters, with the Water and Power Electric Co. car traversing the terrain beneath a starry sky ends badly for the unfortunate worker here, where it served as a strictly benign, conscience-raising experience in the original. With the look of early Spielberg incompatibly coupled with the sensibility of late Spielberg, what serves to differentiate Super 8 most glaringly from the flicks that inspired it is this quite casual mean streak, which seems more in keeping with the Spielberg produced Gremlins and Indiana Jones and the Temple of Doom, the movies that induced the MPAA to invent PG-13, the same rating Super 8 got slapped with. Abrams’ lethal alien creature seems far more informed by the essence of grown up cynicism than it does childish innocence. Maybe it’s the kids themselves who have changed in our post-Columbine, internet age, where the concept of a family friendly alien from outer space seems naïve in the extreme, even to them. Regressing himself back to childhood, Abrams approaches this material with reverence rather than tongue-in-cheek, but Super 8 never succumbs to sappy sentimentality the way Spielberg’s movies occasionally did. Just when we think it is in danger of doing so, everyone gazing up enthralled by the departing spaceship (which likewise seems just more of the same), the director cuts to an amusing shot of the unconscious stoner, sleeping soundly through the magnificent sight. Abrams’ injection of the walking dead into a movie about aliens doesn’t jibe any better than it did in Plan 9 from Outer Space, but at least the theme is turned to metaphorical purpose by movie’s end. On the surface, it just seems like pandering to public tastes, deigning to the current popularity of zombies with the younger generation. 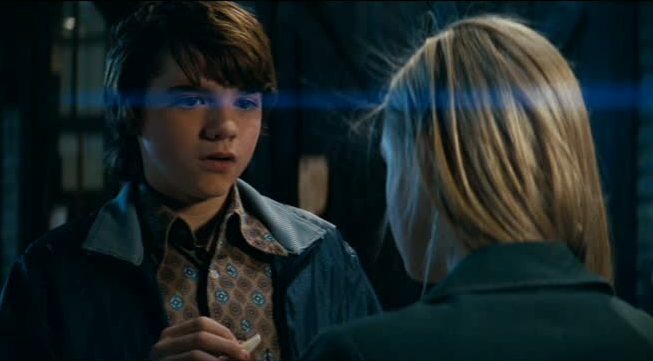 Super 8 is angling for popular appeal as shrewdly as any vintage Spielberg release, but this ties in so neatly with Abrams’ other efforts at emulation one can’t be quite sure if that’s a flaw or an attribute. His homage has been shaped in such a way that criticisms like these are instantaneously invalidated. A minor masterpiece as far as such things go, Super 8 gives us the best of both worlds, combining the artist’s deeply felt, personal vision with the box office appeal of an entertaining commercial blockbuster. As an apprentice director, Abrams has learned well from his mentor, diligently following his example. But that’s why many will find Super 8 a dubious distinction at best, considering it seeks to sanctify the same universally beloved Spielberg who is, along with George Lucas, more responsible than any other director for establishing the special effects-laden summer blockbuster as the cornerstone around which the entire film industry now turns, making it increasingly difficult for moviemakers to get more personal projects of artistic integrity off the ground. Jaws and Star Wars set the precedents in the ’70s. It could even be uncharitably argued that Abrams has here slipped back into the ranks of the many Hollywood hacks who shamelessly tried to replicate Spielberg’s signature style in his own heyday, hoping to ride the coattails of sci-fi cinema’s greatest wizard (and wield the same magic at the box office). 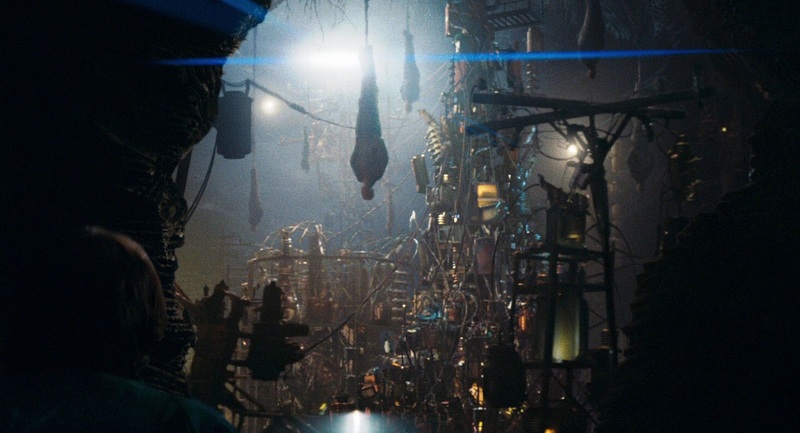 This resulted in hybrids like The Goonies (which Spielberg wrote and produced), along with movies like Explorers and The Monster Squad (which he didn’t). But it’s not only the elapsed years that separate a hack job from genuine homage, it’s also the innate artistry involved in their making. Just as Raiders of the Lost Ark elevated the shoddy Saturday morning serials Spielberg adored as a kid to the level of art, the expertise and care behind Super 8, a masterfully crafted reproduction, distinguish it as something more significant than second-hand Spielberg. Abrams makes room for his own memorably iconic moments, such as when a pack of dogs fleeing from an unseen pursuer, stampede out of the darkness and past the befuddled sheriff at the gas station. Indeed the movie’s finest flashes are these original ones which are inspired by Spielberg but don’t seem entirely derivative of him. At such times, when Super 8 unexpectedly veers from form, it does manage to match its source of inspiration. Like his protagonists, like Spielberg himself, Abrams first got interested in filmmaking at a young age, shooting his own amateur super 8 movies on a camera his grandfather gave him. And he’s used this movie to delve into a subject that Spielberg never explored, the interrelationship between form and content. It is in this frame of mind that Super 8 takes its premise, its title flickering onto canvas as though it were being beamed from a projector. Using Spielberg’s early works simply as a starting off point, Super 8 becomes a delightfully unpretentious examination of the ‘art’ of making movies and the love of the director (both of them) for the artistic process. There’s this intriguing subtext surging beneath the films’ surface like that subterranean labyrinth of caves burrowed under town. All these kids from splintered homes have bonded together to form their own surrogate family in a sense (though their rapport consists primarily of insults, zingers and wise cracks), offering each other the emotional support they don’t receive from the dismissive adult world by encouraging each other in the silly belief that they’re creating fine art. Abrams has layered Super 8 in a way intended to make audiences fondly remember how eagerly they once responded to film, the same way his cleverly packaged literary publication S made readers recall the singular pleasures the printed word can offer that electronic media can’t duplicate. A wistful celebration of film in a post-video age revolutionized by digital camcorders, Super 8 captures Abrams’ youthful exuberance with making movies, back when the prospect seemed glamorous, a real thrill. Proprietary possession of one’s own film camera was priceless then, beyond the means of all but the biggest Hollywood hotshots, as opposed to today where everyone has the capability of making movies built into their iPhone, but only use it to the creative extent of posting selfies to social media. All the myriad uses of the magical super 8 camera, to invent fantasy as well as record reality, are brought into play as this technological marvel becomes the unofficial star of the film, being treated like the greatest tinker toy ever invented for teens. It’s even more fun than the magnetized, shape shifting alloy littering the crash site and resembling steel jacks crossed with the ubiquitous Rubik’s Cube (the debris proves to have otherworldly physical properties, and is summarily hauled away by the military in egg crates). Joe even uses the super 8 camera as a telescopic lens, zooming in on the wreckage to discover it was an Air Force transport that derailed. Rarely has the subject of film been so integrally integrated directly into the plot of a movie. 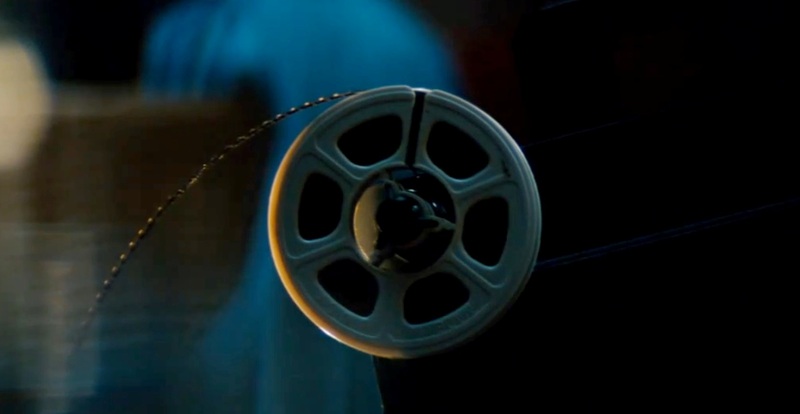 So it seems poetic and proper that the mystery itself should begin with the alien being captured on camera and solved by the discovery of dusty old canisters containing Woodward’s film reels. When Donny replaces Alice in the driver’s seat to chauffeur the kids into the quarantine zone, the movie itself appears to be unspooling back in time, with the train derailment becoming the even more suspenseful bus attack in the second half. 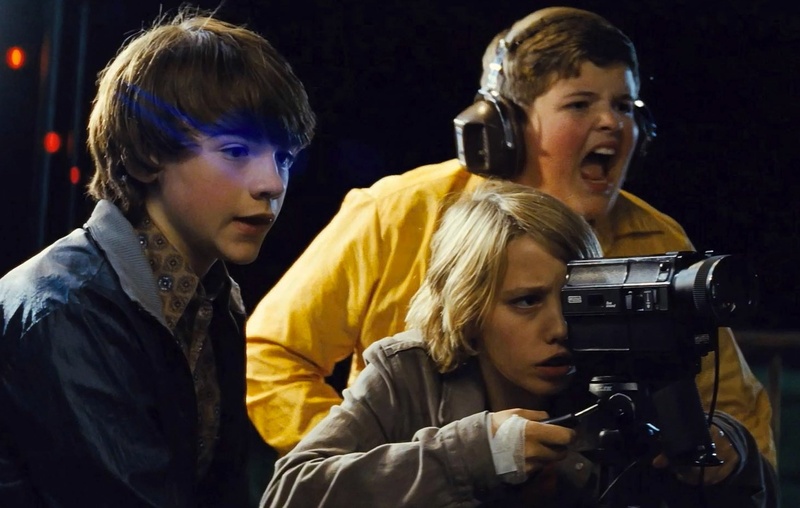 Super 8 is a mainstream, studio produced motion picture yet it retains sympathy for the indie filmmakers struggling against the majors to get their product produced and distributed. The kids here face a similar uphill battle, planning on entering their zombie flick into a “film festival against 15- and 16-year-olds who have better stories and cars and production value.” The movie should have pursued this narrative thread, offering up further insights into the creative process as Joe’s friends try to find the story that will link together their enthusiastic, ambitious ideas. One would think it would become the story we’re watching unfold, but Abrams’ script makes little attempt to have the super 8 movie the kids are shooting reflect, comment upon or even be directly impacted by the real life events transpiring all around them. 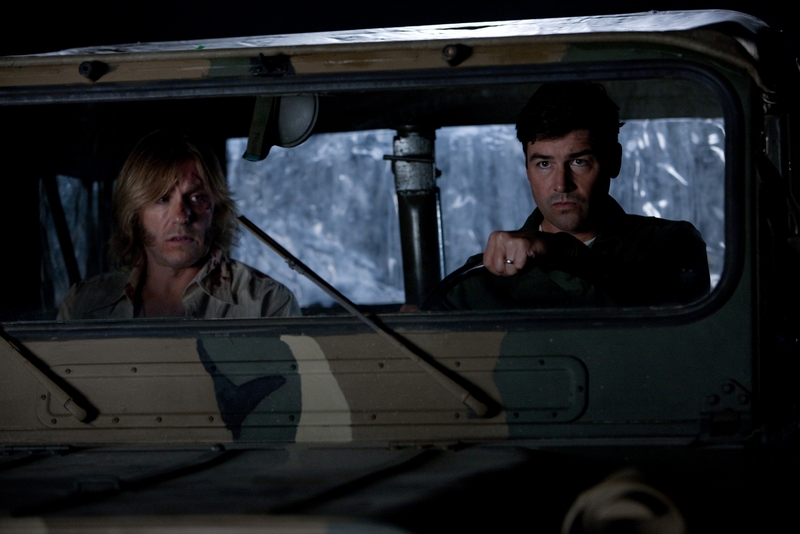 Despite their similar subplots, Joe and his friends never get the notion to switch the subject of their film from zombies to aliens, though with only slight tweaking it would have played just as well. The kids appear to have every aspect of production they need except a skilled scenarist to bring it all together. Movies begin as stories, but the one they’re shooting appears as though it were being improvised as they go along, with Charles rewriting new lines right up until the camera rolls (“Wait, so, I don’t have new lines right? Because I just learned these.”). The director intuitively realizes that having a love interest will give his film a rooting interest (“So when he investigates this zombie stuff, you feel something, you don’t want him to die because they love each other.”), but he doesn’t have the knack to recognize a good story even as it unfolds all around him. Like Super 8 itself, his movie might have benefited from the more objective input of a professional screenwriter. Super 8 taps in to the power of the camera’s eye to see, to make reality appear more substantial. As Charles tells Joe while watching a televised piece on the train crash, “It’s on the news, that means it’s real.” Joe remembers that his mother “Used to look at me this way, like really look, and I just knew I was there, that I existed,” as the filmed subject must also feel when caught in the camera’s line of sight, giving them an objective existence they aren’t felt to possess on their own. When the alien looks Joe square in the eye at the end, seeing him as a person, he experiences the same sensations his mother’s gaze used to give him, the same willies he got when Alice looked at him at the train station, prompting him to ask her to close her eyes. Joe’s association of Alice with his mother is made plain enough, and if the alien is meant to personify his grief over her death, then its possession of the same way of ‘looking’ makes perfect sense. But the movie seems to be trying to draw some amorphous correlation between Dr. Woodward and Joe’s mom as well. Following his suicide mission, Woodward is said to have taught biology at Lillian Middle School for the last six years while Joe’s mom was employed at the Lillian Steel Mill during the exact same period before her own untimely death. 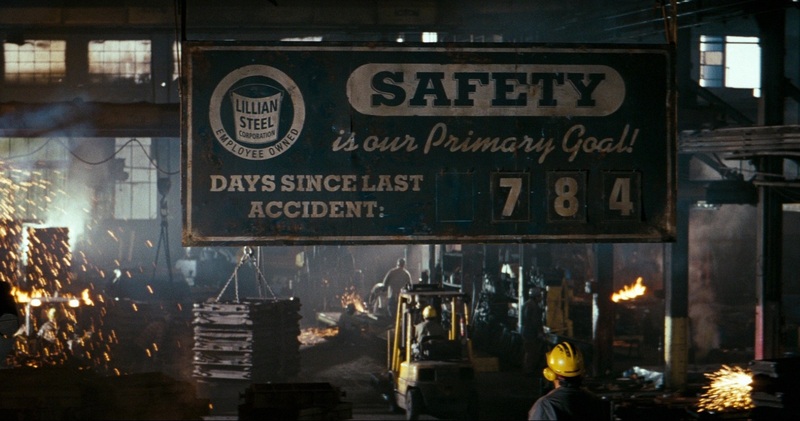 Super 8 even opens on the image that inspired Abrams before he’d devised an actual script, the billboard proudly proclaiming it’s been 784 days since the steel mill’s last accident, as it’s poignantly reset back to day 1. Just as Joe is reminded of his mother when he and the alien lock eyes, we’re obviously meant to ourselves be reminded of Woodward’s earlier words to Nelec that, although the two of them didn’t always see eye to eye on their treatment of the alien, “He’s in me, you know, as I am in him. So, when you see him next, as I’m sure you will, I’ll be watching you too.” Obviously Abrams is trying to draw a parallel of some sort here, but is at a loss to effectively convey what precisely it signifies. At its most effective, Super 8 has been structured into a touching tribute to the restorative power of film itself, as well as its ability to preserve memories for posterity, allowing viewers to relive and resurrect their past every time they unreel. At his mother’s funeral, Joe’s friends fretted that he’s “not gonna want to do my movie anymore… the story is about the living dead,” suggesting that the concepts of art and reality are too closely associated in Joe’s mind. Not able to locate Alice following the train wreck, for instance, Joe happens across a smattering of red syrup that turns out to be his own fake stage blood, giving viewers pause for a moment to reflect along with him on whether what we’re seeing is real or theatrical contrivance, the film itself, or the film within the film. But through Joe the creative process is shown to have miraculous healing properties. His moviemaking becomes art therapy, giving the character a safe coping mechanism which he can use to work through all his unresolved issues concerning his mother’s death. Film allows Joe to bring her back to life in a sense by playing their old home movies on his super 8 projector, resurrecting her on screen (“It’s so weird. Watching her like this. Like she’s still here.”), the way Karen Allen did her dead husband in Starman. Rather than bringing up unpleasant associations, working on Charles’ zombie film is a cathartic experience, further allowing Joe to sublimate the desire to raise his mother from the grave by ‘projecting’ his feelings onto the older, more experienced Alice who wears a matronly bun and pearls in the film, applying makeup that turns her into the very image of the living dead. When Alice pops out from hiding safe and sound following the train crash, immediately after the thought crosses Joe’s mind that she’s been killed, she seems to have been restored by some miraculous agency in answer to his silent prayer. It’s gratifying wish fulfillment for this bereaved boy longing for his mother to do the same. He’d transgress onto the other side if he thought he could restore her to life so Joe’s discovery of the alien burrow beneath the local cemetery where he goes to visit her grave serves as an entry point into the underworld for him. He is Orpheus descending and retrieving Alice from these catacombs, recalling her to life, serves as his final act of resurrection. Still longing for his mother to return to him the same way, realizing his impossible dream by proxy, bringing Alice back from the dead, emotionally prepares Joe to let go of the grief encased in that locket and embodied by the alien visitor. Despite the big build up, Super 8 sort of dissolves at the finale, leaving us emotionally hanging. However, those who feel a case of cinematicus interuptus coming on should stick through the closing credits to see the completed zombie film within the film, which has as much interest, inventiveness and amusement as Super 8 itself. The snippets sprinkled throughout have whet our appetite to see the little flick in its complete form, same as our glimpses of the alien made us curious to see what it looked like full length. And unlike that alien, the self-contained zombie short doesn’t disappoint. To the contrary, it’s just about the funniest thing in Super 8, as we’re encouraged to laugh at the clunky ineptitude of the Z-grade production with its bad acting, impossibly stilted dialogue, rhythmless editing, bargain basement special effects, questionable casting choices with Cary, the smallest (“At least I don’t have to use a booster seat.”) and least threatening among them cast as the zombie menace, fuzzy, out-of-focus photography, and the pretense of little kids make-believing they’re grownups while the real deal appear in the background behind them, shattering the illusion. Yet the amateurishness fails to dampen their enthusiasm for the project they embark upon with all the fervor of true artistes, so we laugh while still appreciating the creative brilliance of Abrams, who has perfectly conveyed the mad genius of cinematic ineptitude like no director since Ed Wood. The negligible result is cleverly juxtaposed with the polished, professional film containing it, which has been crafted with such superb skill and technical precision, forcing each to stand out all the more starkly by contrast. This zombie centerpiece gives Abrams the chance to show, in compressed, miniature form, exactly what he’s been doing for the previous two hours- piecing together an impressively spot on impersonation of a vintage film from his youth. 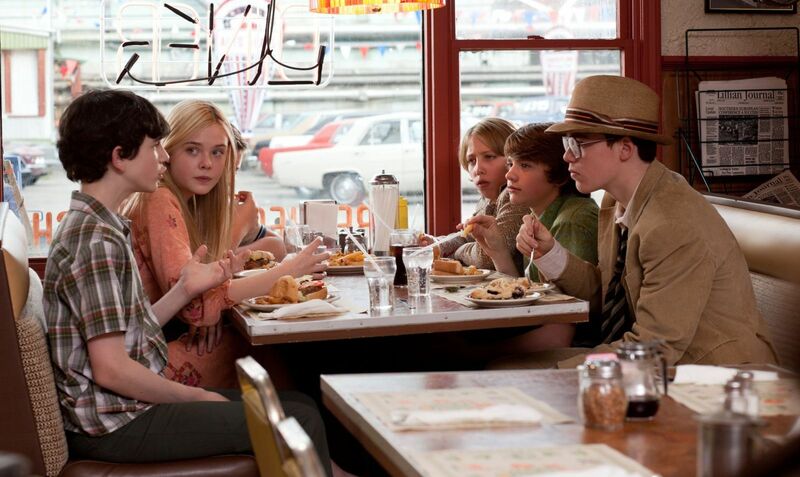 Super 8’s content fully justifies the stylistic form its director has chosen to take. This zombie flick imparts the greater sense of closure his larger movie lacks, providing a perfect wrap to proceedings by showing us how well the picture within the picture, in its purposely imperfect form, turned out. 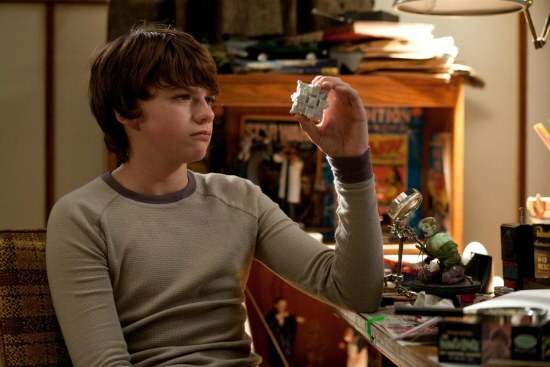 Abrams flirts with the tenets and techniques of Spielberg’s golden age films without really getting at our sentimental attachment to them (or fully conveying why he feels such fondness for them himself), so Super 8 fails to make as vivid an impression as it should. In crafting this film, Abrams is asking us to directly compare him to his own idol and as he himself would freely admit, by doing so he can’t help but come up short. Well-produced, meticulously crafted, affording viewers a vintage eyeful, Super 8 has all the little details down, but it never quite manages to approximate Spielberg’s uncanny eye or his sublime feel for the supernatural chaos coursing below the harmonious suburban surface, just beneath the notice of the busy, workaday adult hub, the living, breathing children’s fantasy world come to life. Still it’s nice to have a semblance of Spielberg back in his prime again, even if it is only vicariously, in this hand-me-down fashion. Especially now that the director himself has turned his back on such trivial concerns in order to establish himself as Hollywood’s new Stanley Kramer, worthy of tackling only the weightiest of world themes. In its way, watching Super 8 lets us relive our own childhoods again, same as making this movie obviously allowed Abrams to relive his. And for those of us nostalgic for the sort of popped corn Super 8 pays homage to, even imitation Spielberg is better than no Spielberg at all. This entry was posted in Fantasy, Science Fiction and tagged alien invasion, Close Encounters of the Third Kind 1977 movie, E.T. 1982 movie, Elle Fanning, filmmaking, homage, J.J. Abrams, Joel Courtney, Kyle Chandler, Let Me In 2010 movie, movie makeup, Ron Eldard, Steven Spielberg, Super 8 2011 movie, The Artist 2011 movie, zombies. Bookmark the permalink.